Riding an explosion of sensors, megacity AI ‘brains,’ high-speed networks, new materials and breakthrough green solutions, cities are quickly becoming versatile organisms, sustaining and responding to the livelihood patterns of millions. Setting its sights on self-sustaining green cities, the UAE has invested record sums in its Vision 2021 plan, while sub-initiatives like Smart Dubai 2021 charge ahead with AI-geared government services, driverless car networks and desalination plants. A trailblazer of smart governance, Estonia has leveraged blockchain, AI and ultra-high connection speeds to build a new generation of technological statecraft. 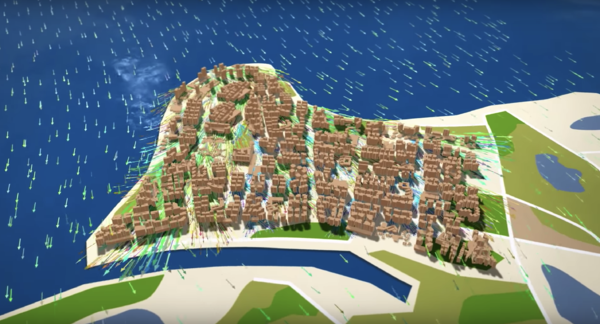 And city states like Singapore have used complex computational models to optimize everything from rainwater capture networks to urban planning, down to the routing of its ocean breeze. Last week, I explored responsive urban networks, self-charging infrastructure and new materials for construction. While not given nearly enough credit, the personal vehicle and urban transportation stand at the core of shaping our future cities. Yet today, your car remains an unused asset about 95 percent of the time. In highly dense cities like Los Angeles, parking gobbles up almost 15 percent of all urban land area. And with a whopping economic footprint, today’s global auto insurance market stands at over $200 billion. But the personal vehicle model is on the verge of sweeping disruptions, and tomorrow’s cities will transform right along with it. 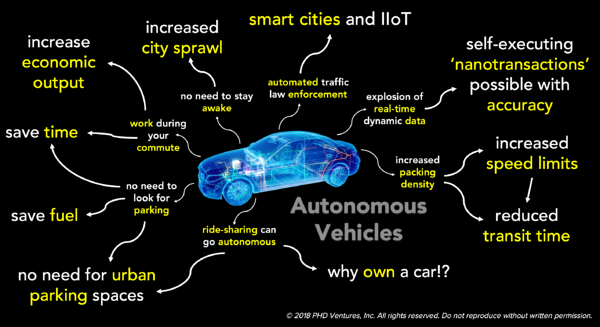 Already, driverless cars pose game-changing second-order implications for the next decade. Take land use, for instance. By 2035, parking spaces are expected to decline by 5.7 million square meters, a boon for densely packed cities where real estate is worth its area in gold. Let’s imagine a 100 percent autonomous vehicle (AV) penetration rate. Cars have reached Level-5 automation, are 100 percent self-driving and can now communicate seamlessly with each other. With a packing density 8X what it is today in most cities, commutes now take a fraction of the time. Some have even predicted aggregate time savings of over 2.7 billion unproductive hours. But time savings aside, cars can now be entirely reimagined, serving a dual purpose for sleep, office work, morning calls, time with your kids, you name it. 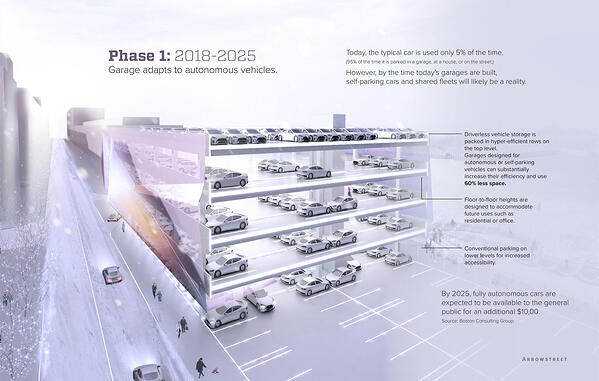 In the near future, however, vehicles — not drivers — will book vertically stacked parking spots and charge CaaS suppliers on their own (for storage). This is where 5G networks come in, driving down latencies between driverless cars, as well as between AVs and their CaaS providers. Using sensor suites and advanced AI, vehicles will make smart transactions in real-time, charging consumers by the minute or mile, notifying manufacturers of wear-and-tear or suboptimal conditions, and even billing for insurance dollars in the now highly unlikely case of a fender-bender. Already, China Unicom has established critical communications infrastructure with an NB-IoT network that spans over 300 Chinese cities, additionally deploying eMTC, a lower power wide area technology that leverages existing LTE base stations for IoT support. On the heels of over ten years of research and 50 billion RMB (over US$7.4 billion), Chinese insurance giant Ping An released a white paper addressing smart city strategies across blockchain, biometrics, AI and cloud computing. With the rise of urbanization, I’m led to the conclusion that megacities will become the primary nodes of data acquisition, data integration and thereby the primary mechanism of governance. In just over 10 years, the UN forecasts that around 43 cities will house over 10 million residents each. 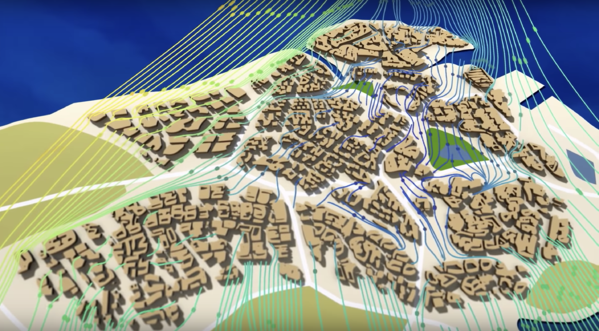 Autonomous and flying cars, delocalized work and education, and growing urban populations are all beginning to transform cities into interconnected, automated ecosystems, sprawled over vast swaths of geography. Now more than ever, smart public services and automated security will be needed to serve as the glue that holds these megacities together. Public sector infrastructure and services will soon be hosted on servers, detached from land and physical form. And municipal governments will face the scale of city states, propelled by an upwards trend in sovereign urban hubs that run almost entirely on their own. Perhaps the least expected on a list of innovative nations, this former Soviet Republic-turned digital society is ushering in an age of technological statecraft. Hosting every digitizable government function on the cloud, Estonia could run its government almost entirely on a server. Citizens’ healthcare registry is run on the blockchain, allowing patients to own and access their own health data from anywhere in the world — X-rays, digital prescriptions, medical case notes — all the while tracking who has access. After companies are registered online, taxes are near-entirely automated — calculated in minutes and transmitted to the Estonian government with unprecedented ease. Possibly a major future smart city staple, systems similar to this latter blockchain-based network could one day underpin AVs, flying taxis and on-demand Fly-as-a-Service personal drones. Even in the realm of feeding its citizens, Singapore is fast becoming a champion of vertical farming. It opened the world’s first commercial vertical farm over 6 years ago, aiming to feed the entire island nation with a fraction of the land use. Bringing together mega-economies, green city infrastructure and e-services that decimate inefficiency, future transportation and web-based urban services will shape how and wherewe live, on unthinkable dimensions. Networked drones, whether personal or parcel deliveries, will circle layered airways, all operated using AI city brains and blockchain-based data infrastructures. Far below, driverless vehicles will give rise to on-demand Cars-as-a-Service, sprawling cities and newly unlocked real estate. And as growing megacities across the world begin grappling with next-gen technologies, who knows how many whimsical city visions and architectural plans will populate the Earth — and one day, even space.